Keep your shop clean and wallet happy with this combo offer featuring our most versatile dovetail jig ever! Cutting beautiful through and half-blind dovetails is fast and easy with our new and improved dovetail jig! 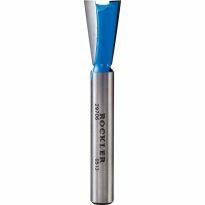 Rockler's exclusive one-piece stop gives you the perfect offset every time for dead-on dovetailing accuracy. 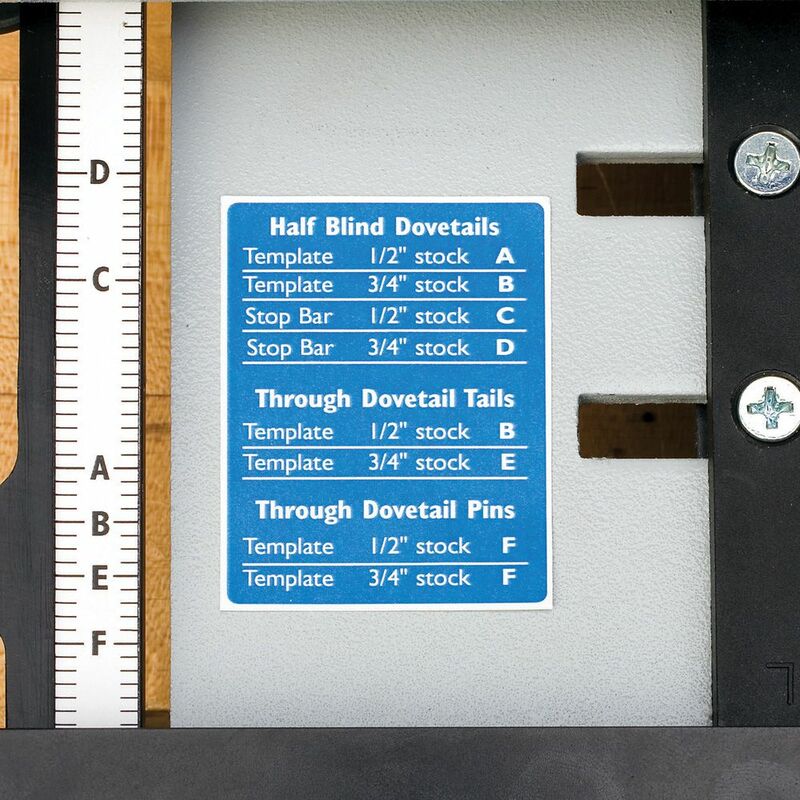 And our new preset template guide allows for quick initial setup for 1/2" to 3/4" thick stock. Jig will cut half-blind dovetailed joints from 1/2" to 1-1/8" thick and full through dovetails from 3/8" to 3/4" thick. Accommodates stock up to 11" wide. Requires router with 1/2" collet. 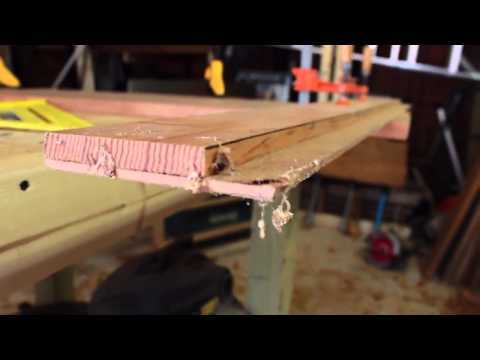 You don't have to spend hundreds of dollars to get dust collection with a dovetail jig. 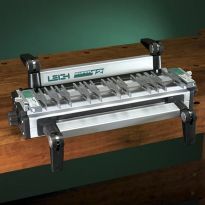 Our revolutionary new dust collector eliminates virtually all the dust created when cutting dovetails. It easily attaches to Rockler's Dovetail Jig and a shop vacuum or dust collection system to provide you with a clean cutting area and safe working conditions. 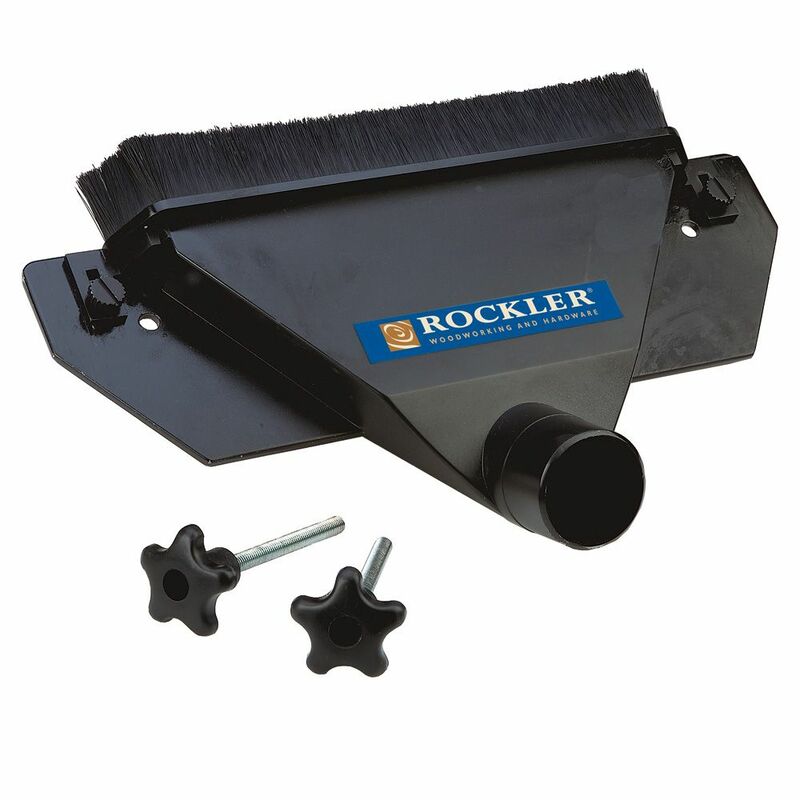 Sweep brush adjusts to provide a complete seal for stock thicknesses of 1/2" up to 1-1/8"
Well worth it, well made. Very well made. Still learning with it but I will say I'd would recommend it. The price was also great. Very impressed with this jig So far it is working as expected I’ve had a little difficulty fine tuning it but I think I am getting the hang of it.by the grace of God with more practice I will be a pro. I purchased this item with no experience in dovetail joinery (my kit included the dust collector - I did leave a review for that item separately). I was able to unbox, set up, and create my first dovetail joint within an hour (not including prepping the stock). The instructions could be somewhat better, but given attention to detail, this jig gave me quality joints very quickly. Very few difficulties. The only problem I've had is trying to figure why I waited so long to get one! A great buy for the money. Much easier to set up than my old jig. Faster than my old jig because of the cam clamps. The dust collector is a blessing. My shop is much cleaner and my work proceeds faster because I don't have to clean after each dovetail set. As I am making 24 drawers with each corner dovetailed, this jig is definitely increasing my throughput. I am very pleased and satisfied with this jig. While it has a bit of a learning curve, once you get some practice with scrap/etc., it's a very handy jig to have around. I did lose one of the springs when adjusting it, and Rockler responded in quick fashion to replace, gratis. It's not a Leigh, but it's also in a far lower price class. I'm sure one of these days I'll finally make the jump up, but for now I have no real reason to as this does everything I ask of it. It works like it supposed to work. 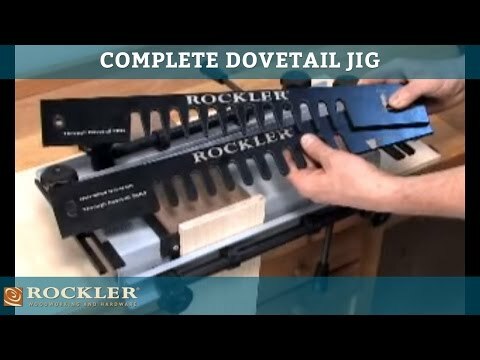 I almost didn't buy the Rockler Dovetail Jig because of some of the reviews. 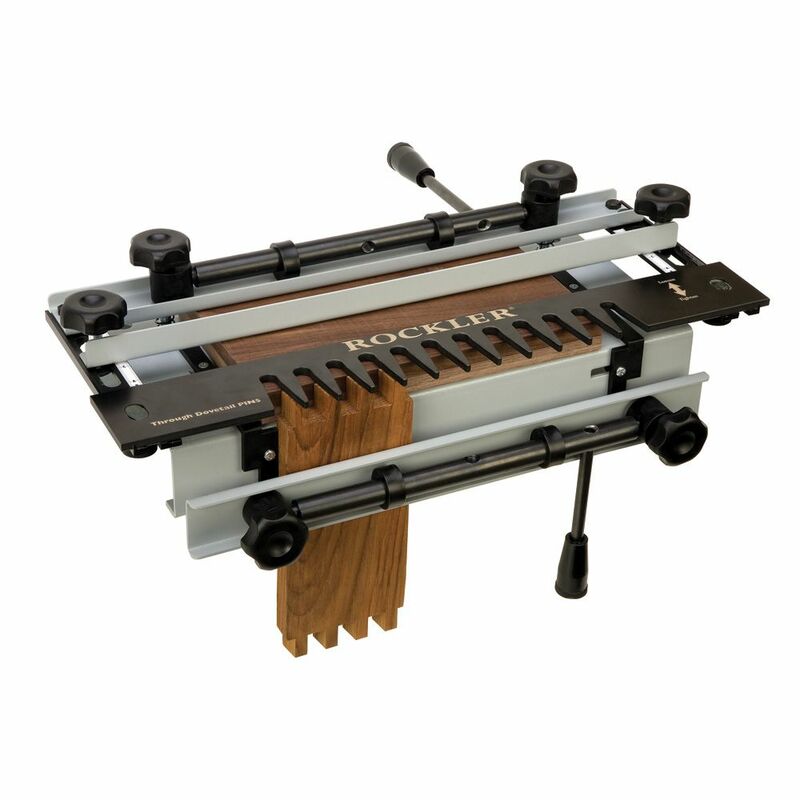 I have always had great service and quality from Rockler. I relied on that history and placed the order. Less than 1 hour after removing the jig from the packing box we were making drawers with great results. The jig performs as it should, producing the results I expect. It gets 5 stars from me. dovetails. BUT a major design flaw is, once you install the dust collector, you can no longer access the adjustable L-shaped stop with a screw driver. You have to disassemble it just to turn a screw. Additionally that L-shaped stop is plastic which is subject to flexing. That critical part should be metal. Dovetail unit works well. Dust collector attachment slows down the setup process since it has to be removed to make adjustments. Other than that, very happy with unit. 2nd time doing dovetails, so expected some difficulty, but....kept the instructions opened up, followed the procedures and made some beautiful work. If you follow the instructions, use your brain and don't expect the jig to do the work for you, you will do good. Also, love the dust collector. It grabs 98% of the dust so you can see what you're doing... unlike an old Craftsman jig I used that is like trying to see thru a dust storm. I also like the brush on the dust attachment; while your vacuum system is still running, remove the boards and wipe any residual dust caught in the end cuts and/or wood peelings away and it's gonzo....and your pieces are ready for assembly. Jig itself seems good, I've been fiddling with it, and making some good tight joints......once it was set up right. 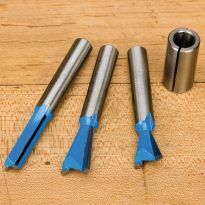 Couple issues I had were that there was no mention on the website that a base plate was not included for the router bit guide bushing that was included, had to order that separately, $15. Also, the bits are 8mm, and they provide a 1/2" collett adapter for that. Why not just include a 1/2" or 1/4" bit? Most 1/2" routers have a 1/4" adapter anyway, an 8mm bit is silly in my opinion, as I can't use my 1/2" bits. Next issue is if you want to use anything other than the 8mm bit that is included, you will also need a new guide bushing, since the guide bushing is set up for the 8mm bit. 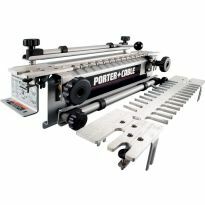 Very frustrating to say the least, so my recommendation is that if you buy this jig, make sure you have a router baseplate that will fit your guide bushings, a router bit that you like (unless you want to use the rockler 8mm), and guide bushing adapter set to go with the baseplate and bit size that you want to use. I had none of this up front, and had to purchase separately, just to use my 1/2" bits. It does not work with Ryobi routers without additional adapters. Once I got everything connected it does work. A few helpful tweaks for users. 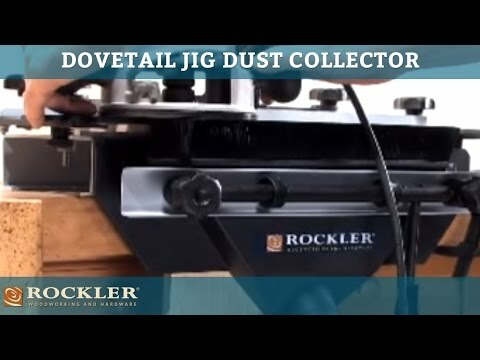 I purchased the Jig and dust collection system an overall I am very pleased, so I offer what I hope will be some helpful comments for users and Rockler in next versions. Dust Collector: This device works very well at picking up about 95% of the sawdust. Very difficult to adjust the side stops with the collector in place. I slotted the holes in the collector so it can slide down an inch while making adjustments-- screwdriver can reach the set screw. ( I found this suggestion on the web.) A piece of wood between the collector and metal compression bar holds it up while in use so it doesn't slide down while placing stock. I snipped the bottom tabs of the brush connectors so it can slide up higher and be removed easily if needed for adjustment. The plastic plate of the dust collector is what compresses the wood stock during routing. This plate seems to have an uneven distribution of pressure although it seemed to work ok. I will be trying to add a second metal plate to go inside the dust collector in addition to the original one on the outside. 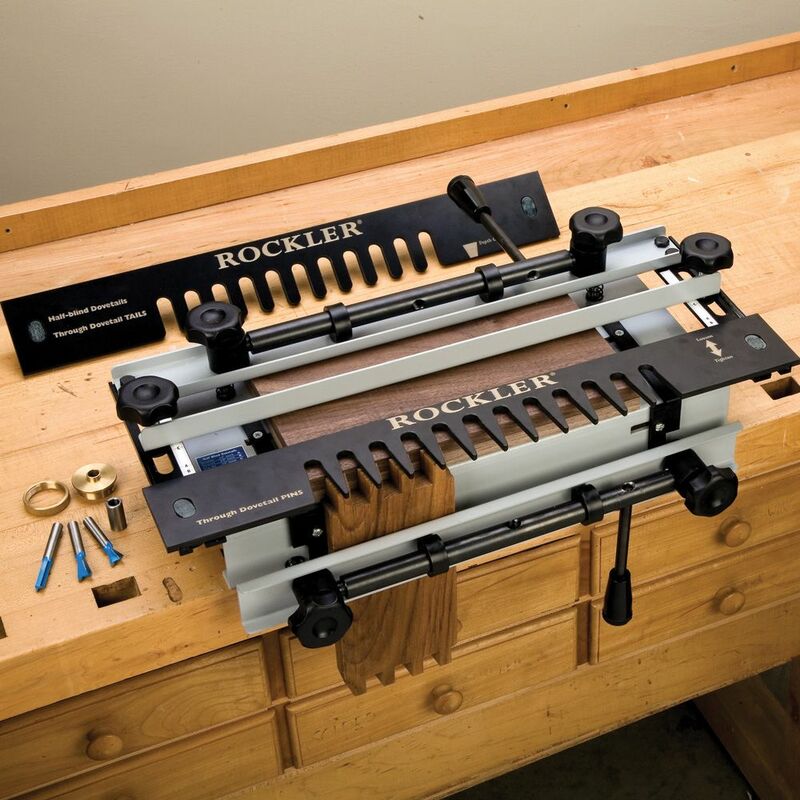 For Rockler this may be worth including with the kit. The Jig: The Jig works well for its price point, but I can see why some others cost 2- 3 times more. The set up is done by a lot of trial and error as the thickness slides, wood stops, and stop bar are adjusted by eye and then tightened by hand. It took me far longer to set up the jig than it did to do the dovetails for 8 drawers. I wish --at at this pricepoint: Adjustments could be made with fine adjustment screws. Better way to center the stock on the template Right and left had individual clamps so right and left could be loaded at the same time. The template were beefier-- it has more give than I like. Better directions or include a DVD Move the bit depth gauge elsewhere very hard to use in its current location with the dust collector. Again I am overall very pleased with my purchase, but there is always room for improvement. Somewhat disappointed in the use and results. I purchased this jig along with the dust collection attachment awhile back, but for various reasons (including illness), I haven't had a chance to try it out up until now. I must say that I was somewhat disappointed. First of all, I'll admit, the dust collection attachment works very well for keeping the sawdust in check. However, when attached, it is a pain in the you-know-what inserting a vertical workpiece. One has to keep fiddling with the adjustment knobs in order to get a workpiece to fit into position. 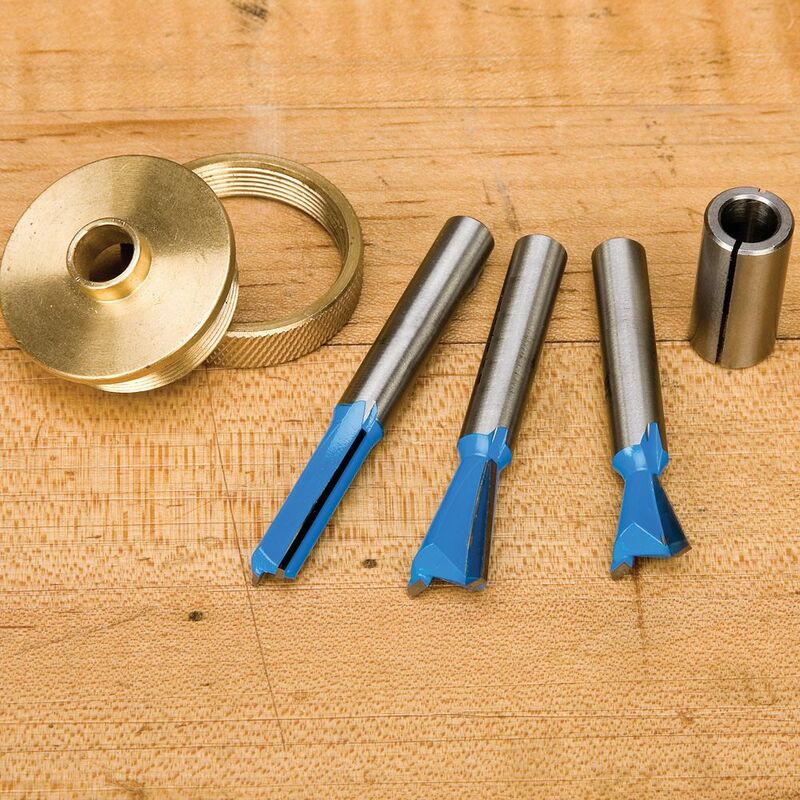 You almost have to screw them three-quarters of the way out and then, when the workpiece is place, screw them all the way in again to tighten up the piece. A time-waster, in my opinion. Also, I would suggest that instead of a plastic backing to the dust attachment, the use of a metal piece would go a long way for getting the unit into position for a cut. The plastic backing has a tendency to bend when tightening the adjustments and the sliding adjustable dust blind inside the unit is useless for moving side to side. Now, to the nitty-gritty. I studied the instructions several times through before doing anything with this jig. (some of the black-and-white pics were very faded as to make it hard to figure out what was shown). I even when on-line to YouTube to see how dovetails were cut with this jig and other jigs, just to familiarize myself with the process. First of all, I was cutting 3/4 by 3 1/2 stock for drawer sides. The instruction of lining up the end of the vertical piece equally on either side of the comb teeth were useless as this size stock didn't come out on the left side at all. I had to keep fiddling and fiddling to find out a happy medium to get the cuts so that they were somewhat balanced. Secondly, adjusting the stop is nearly impossible with the dust collector in place. When you think you have the tail piece in place and you want to move the adjustable stop...whoops, you have to loosen the dust collection in order to get to the screw and there goes your set-up. This jig isn't the easiest to use at all. I never could get some decent dovetails cut so that they were a good fit and have both workpieces even with each other. If I had to do it all over again, I would probably invest in another more expensive jig and would probably get better results. The only reason I have this review two stars is because I was impressed on how well the dust collector worked. I was ready to build some excellent drawers for a current project. Set up the jig and loaded my new 1/2 powerful Bosch router sadly to find it required an adapter to the 8 mm bits. This was designed for a Porter Cable router apparently. So that was a day and a drive to Rockler store. Bought a new collet as the early trial chewed the ill fitting bit. I watched the YouTube videos several times but didn’t address the need function for plywood spacers. The offset seemed very logical but using it was far more complex and it seemed I was only a missing step away from success. Trial failed. Project was delayed, I was determined. Went back to the distant Rockler store to seek advice and consul. No one there had used one and no classes were planned. Called the company and didn’t discover the missing step for success. I took the summer off to try again with a fresh brain and a couple days to waste perfecting this tricky beast. Rockler gets a D- for useful knowledge. This is advertised as a 12" dovetail jig. Description says it will take stock up to 11" wide(?). Measurement to the outside of the fingers to center the stock is only 10-1/2" max. This leaves either 1/2" on one side hidden or 1/4" on both sides hidden. So how do you center even an 11" board if you can't see it. Also says requires a 1/2" shanked router. Well, the bits they give you are 3/8" or metric and the collar is some funky off size too. Email ad. And a great price!! Super Sale! 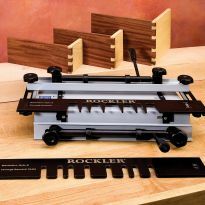 Good price, and the Rockler name! Was going to buy one years ago but the price wet up to much, so the good sale got me. I didn't get a 15% discount on this order! good review and I need it right away. 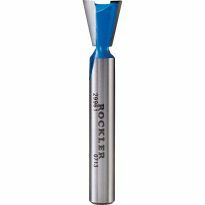 I purchased some other Rockler items and your company has a great product and helps make difficult jobs easier. This jig seems to have more options for the price, plus free dust collection. It was on sale and I don't have a jig. saw a good video on it from Make Something. Awesome deal! Can’t wait for the jig to arrive so I can start experimenting with the different templates. It has good reviews, and now a special price. I wanted to make some high end drawers for my kitchen remodel..
Good deal, great reviews and faster than attempting to make one myself. Good reviews. Simplistic set up. I’m rebuilding my shop and want to use dovetails on the drawers on the cabinet drawers. 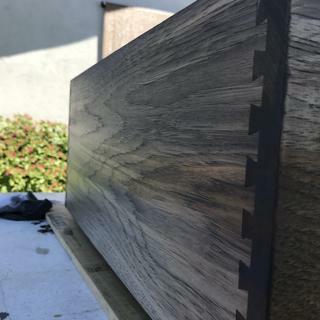 I want to make drawers that have more style. looks like everything i need right now! Sale price, manufacturer reputation and mostly positive reviews. Need to upgrade my box making skills. wanted to try and make some cedar chests. It had everything I wanted at a good price. 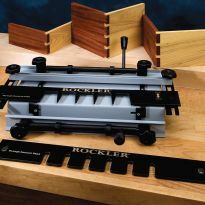 Plus, Rockler is great brand. Total noob at woodworking here. I'm trying to figure out what parts go with what other parts. What I have is a router and a router table. What do I need to buy to ultimately make the cool isoloc wave, clover, etc joints (after lots of practice)? I wanted to use the table router with RTJ400 but it looks like that doesn't work with the fancy templates. It looks like I need the DR Pro jig and the templates (sold separately, of course). I went to a Rockler store, but the guy I talked to kind of blew me off. 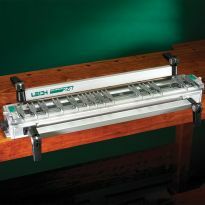 It's been nearly 2 years since I upgraded to the Leigh Jig system. When I purchased my system, they provided very thorough instructions in both print and video formats. 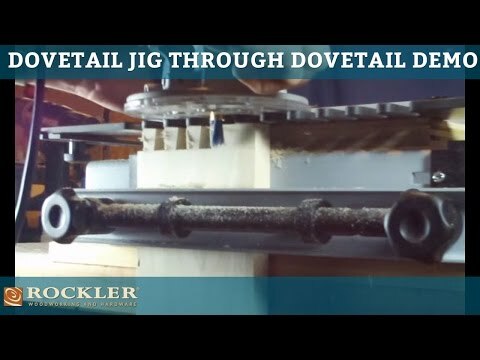 If this is your first dovetail jig system, you're walking right to the Rolls-Royce of them all (in my opinion). 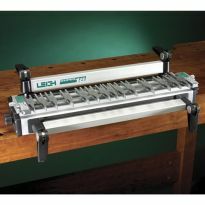 Leigh has some unique features incorporated into their system that can make dovetailing a much more satisfying experience for beginners and professionals alike. 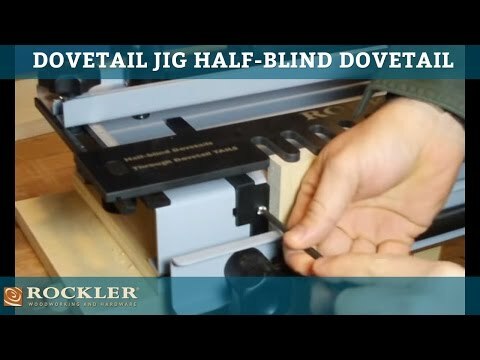 Dovetail jigs are primarily designed for hand held use only. One should have a fair amount of experience operating, maintaining and caring for a hand held router before attempting dovetail routing. I won't assume your experience level, and only mention it for the sake of safety. I have the D4R system which will accept the unique templates you have interest in. I happen to own the "clover" template, but have yet to use it. Leigh seems to be good about giving complete information about all necessary bits and guide bushings when purchasing their accessories. Whatever brand of jig you ultimately land on, this is a craft that will take some practice and patience to master, but it's well worth it. 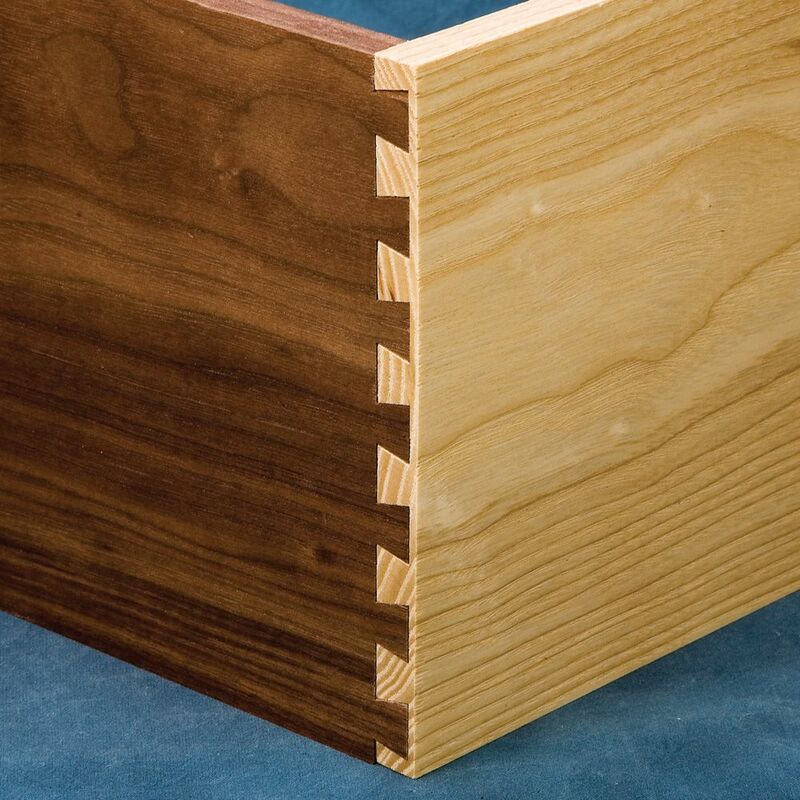 There is no substitute for a tight ffitting drawer joint that could out live your grandchildren! Hope this helped. Remember, safety first. BEST ANSWER: I don't know about yours, but mine didn't come with any instructions at all. I'm having the same issues (plus some... new to this tool). In my first attempt, I've now damaged one of the templates, and probably a router bit. Some simple instructions would have been very appreciated. Which two templates are included? 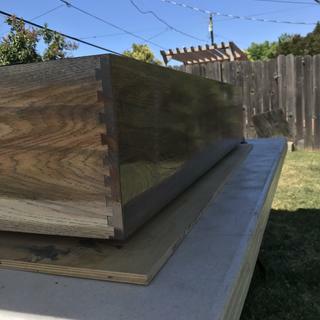 Can I do through and half-blind dovetails (as well as box joints) right out of the box, or will I need additional templates? BEST ANSWER: This jig is not recommended for box joints. 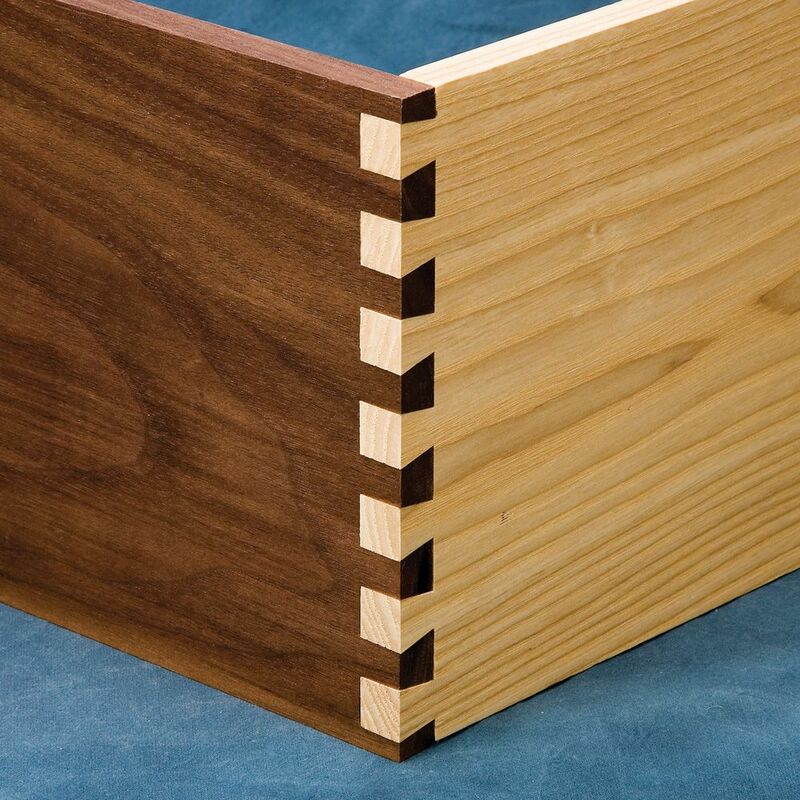 It includes templates for doing half blind dovetails and through dovetails. Why is it not recommended for box joints? What router would you recommend with this jig? BEST ANSWER: It doesn't matter what router you use. Choose one that is in your price range and has the features you want. Personally, I prefer a plunge router. I currently has a Dewalt and a Skil. I prefer the Dewalt, but it is also pricey. BEST ANSWER: Not sure. I had a Dewalt router I used with it and it worked great. 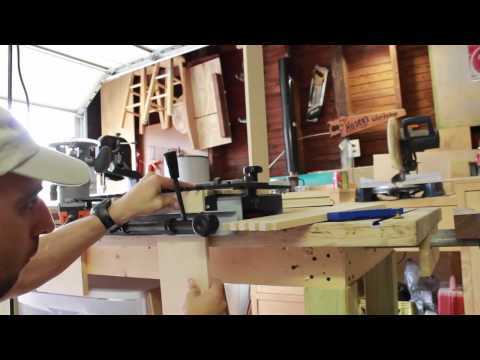 Can this jig cut rabbitted dovetails? 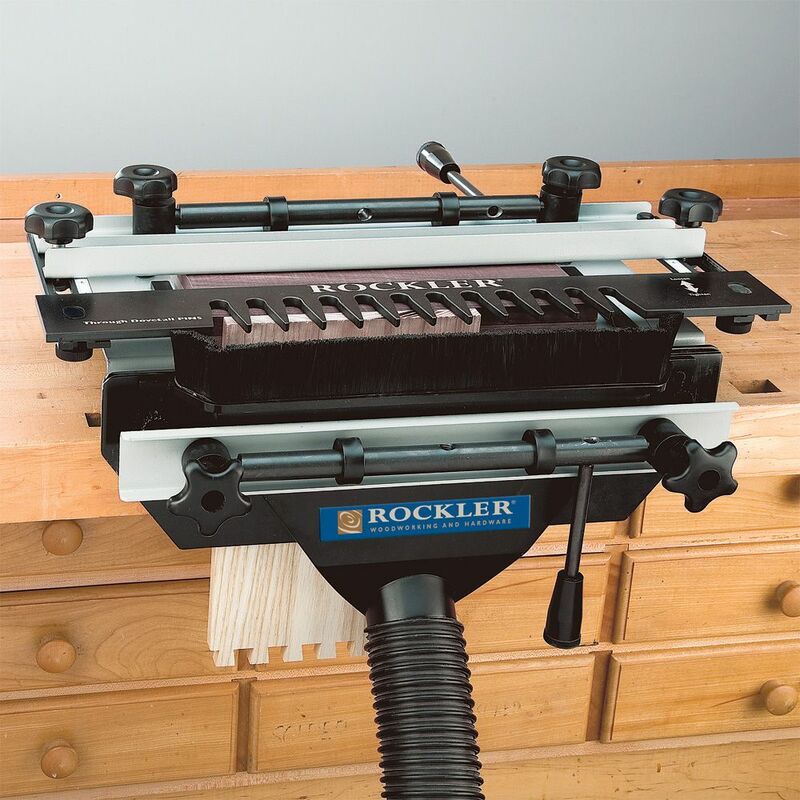 BEST ANSWER: Yes...you can buy the replacement through Rockler. Do I need a guide bushing router plate? BEST ANSWER: My experience was that the guide bushing provided with the dovetail jig fit very nicely on the standard plate on the bottom of my Porter Cable router. how wide stock will this jig cut? BEST ANSWER: No Tom the jig comes with everything you need. It is a great jig.